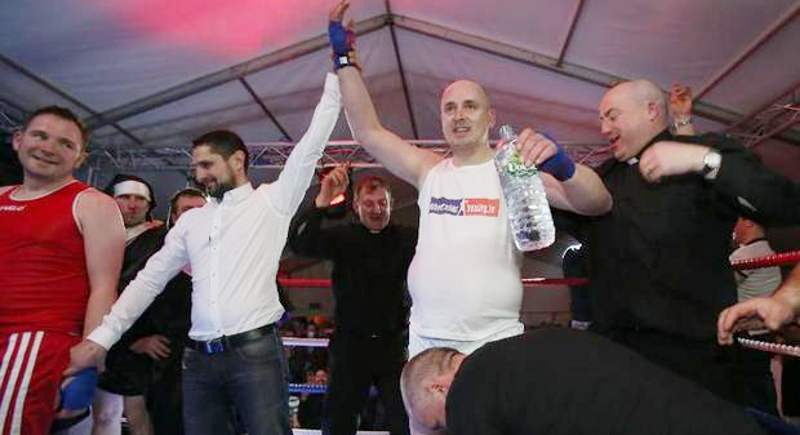 An Irish Catholic priest gave a whole new meaning to “white collar boxing” last weekend after taking to the ring to battle a parishioner in a charity fight. Father Pierre “Jalapeno” Pepper donned the boxing gloves for the first time as part of his parish’s fundraising “Saint Patrick’s Weekend Punch-Up”, ahead of Ireland’s national day on Tuesday (March 17) for its patron saint. The pugilistic priest, 37, became a national sensation after an online video taunting his opponent went viral, leading to a television appearance. In the video, Pepper quotes from the Bible and warns parishioner Jared Madden his opponent of his impending doom while five other priests look-on menacingly. “The Lord says vengeance is mine... say your prayers, because judging time is close at hand,” his opponent is told. Hundreds of locals in the small town of Banagher in County Offaly, on the banks of the River Shannon in central Ireland, packed into a marquee at the back of a pub Saturday night (March 14) to see a number of locals fight – but the clash of priest versus parishioner was the main event for most. White collar boxing, where men and women from “white collar” professions take part in fights, has become a popular method of fundraising for charities in Ireland in recent years. While the event was purely to raise money for charity, Pepper said it also gave him an opportunity to meet the local community outside of church. Although the judges awarded victory to Pepper after the three two-minute rounds, the parish priest was up to celebrate the 8am mass the morning after. And despite the obvious links, he said God was neutral during the match.